View The Mortrix on the Quillax Ship! The Quillax Ship link includes screenshots and some details on the mod. Anyway, have fun with it, and feedback is appreciated! By the way, if you want an additional challenge, each level has their own hidden item that is worth 5,000 points. 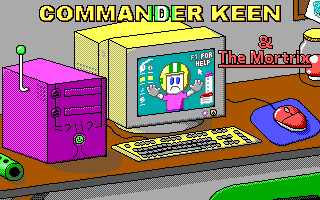 You may recognize these items from another Commander Keen game or mod. Can you find them all? Good luck if you decide to take the challenge! I've got about 4 levels left to beat. So far great level design; levels are well thought out to avoid backtracking and blind jumps. I like the scroll bar elevators. Plenty of SGA to translate which I like. My favourite level so far of course has to be the SMB3 level since that is one of my favourite games. Good attention to detail in that level. I've played a couple levels so far. They're definitely fair and well-balanced. I like the 5000 points idea. It's always cool to see an extra challenge like that. It gives some good replay value. I've only found the first one so far. The animated doors are cool, how they have that little text cursor in them. Is it a built-in function for them to be able to animate like that? I didn't see a patch for doors in the patchfile. @Nisaba About the difficultly, I aimed the mod to be a bit harder than my previous ones, but it should still be manageable. Even then, I'd say the early levels are rather easy; it's the last few levels that I think may require a few tries each in order to beat. @proYorp Nice to hear that you found at least one special item! I was hoping that at least one person would tell what items they've found in the mod. For the animated doors, I changed the tile properties to make the bottom half of the doors animate. Also, did you notice that the bottom half changes with a letter filled when you open it? That's because when a door opens, the bottom tile is replaced by the tile that comes after the top tile! Can someone teach me how to apply patches for unlimited lives? Unlimited lives should have been a standard for all vorticon mods by now. Remember, adding this patch will make you miss the neat Game Over screen. Should be pretty easy. Find the patch for Keen 2 from the wiki and add in somewhere in the middle of the patch file. To anyone who is unable to download or play the mod because your computer says it has a virus (which is ironic, because the mod is about a virus ), I'd like to say that I updated the download link to remove UNLZEXE (which is what is considered by modern computers to be a virus, not the Mortrix itself) and use an unofficial new version of CKPatch, which decompresses KEEN2.EXE whenever you run the mod (you can find it here, underneath CKPatch (unofficial): http://ny.duke4.net/files.html). In my site, I also updated my other mods to use the new version of CKPatch and remove UNLZEXE if it was there. I only uploaded images for the actors, items (not including the 5,000 points ones), world map, and title screen. I thought I'd rather wait for some time to pass before I upload all of the levels, the ending level, and the 5,000 points items. Thanks for updating the download link on KeenWiki! Thanks for the feedback! I was really interested in hearing your thoughts on this mod. What 5,000 points item did you get? Also, what is your favorite level so far? I'm a bit curious to hear more about your opinion on the mod. I think it was the ice cream from Keen 4. After I played the mod through again I realized that I had actually found a few others but had not paid enough attention to notice that they were the hidden collectiables. Now when I knew the levels a bit better I could find a few others too. I'll try to find all of them as time goes. Whereas there are many great levels, I think my favorite is the last one. Getting the red key is the most difficult one for me and I always get that first. (For some reason jumping off a moving platform seems to be the most challenging move for me.) I like puzzles with "ice" tiles and there aren't that many of them in mods or so I feel but this level has some good ones. Getting the green key also requires some nice moves. The Gigabite chase at the bottom of the level is a great idea. The idea of being inside software just works so well! Jumping from window to window, from file to file, the icons, the screen glitches... There are many cool details, like the start menu button. The enemy replacements are interesting. Sprug is my favorite; it's fun to see how they move around -- one can see how some places are designed to keep them moving, which is a nice detail. Edit: The second to last level, the long vertical one, is also one of my favorites. In fact, I might be my new fav. It's such a well-designed level!